​What are my research interests? I am interested in pulsars. Pulsars are remnants of the core of massive stars that have exploded in a supernova. They spin extremely fast. Pulsars have beams of radiation coming from their magnetic poles. When those beams of radiation are aligned with the Earth a series of pulses can be detected with radio telescopes. The time between a pulse's arrival can be timed extremely precisely. This timing can be used in the detection of gravitational waves. How did I become interested in Astronomy? I fell in love with Astronomy when I began working as a tour guide at the National Radio Astronomy Observatory in Green Bank, WV. It inspired me to return to school to pursue a PhD in the field. 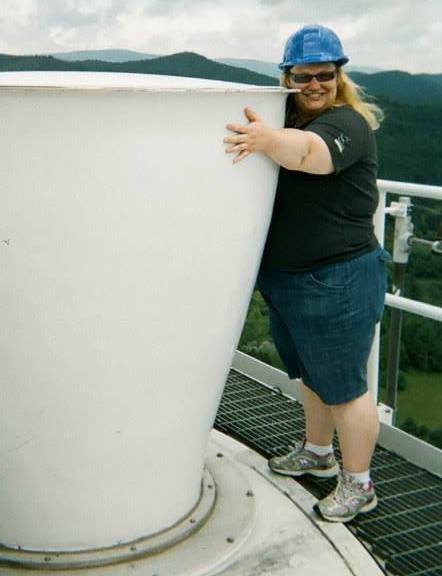 Hugging the L-Band receiver on the Green Bank Telescope.